I love to try various pouring curries. We generally prepare Sambar, Rasam, Moru curry for lunch & soon after, that becomes a routine curry for any thali or any sadya. 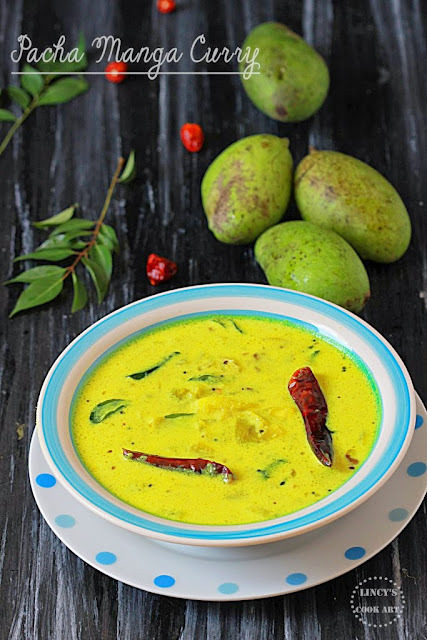 But this is a tasty Ozichu curry/pouring curry from Kerala which has a unique taste and flavour. I have to say this is one of the must try dish for someone who wants to try different pouring curries for lunch. Plain rice and this manga curry and papad are a best combination. Or you could serve this curry with rice, pairing with any vegetable sit fry like thoran or mezhukku puratti. Simple curry prepared within minutes but the taste of the curry is just awesome. Do try this curry during this mango season!!! Peel and cut the mangoes in to medium sized pieces. Peel the onion and cut them length wise. Peel the pearl onion and chop them in to roundels. Slightly crush the ginger using a pestle and mortar or blender. Add coconut, green chillies, jeera and peal onion in a blender jar and grind as a fine paste; set aside. Heat oil in a pan and add Onion, green chillies; cook for a minute and then add the crushed ginger; cook for fifteen to thirty seconds till the raw flavour leaves. Now add the turmeric powder and mix well immediately add the cut mangoes with some salt and mix well. Add 2 cups of water and close with a lid and cook till the mangoes becomes soft but it has to hold its shape. Using a backside of the ladle mash half of the mango pieces to make the sauce tasty and flavourful and leave some as such. Now add the coconut paste and some water to dilute the curry around half to one a cup.Check the salt and add if necessary. Allow to boil the curry. While the curry is cooking other stove prepare the tempering for the curry heat oil in a pan add mustard seeds and fenugreek seeds once the mustard seeds splutter while the fenugreek seeds becomes golden; add the dry red chillies and small onion and fry in that oil. Finally add the curry leaves and allow the onion starts to become golden colour. Transfer the tempering over he curry and mix well. When the curry starts to bubble at the edges turn off the heat. Note: As it is a traditional curry coconut oil is used to prepare this curry more flavourful. But you could use any refined oil of your choice. I love this curry.. lovely flavours and delicious curry to have with rice.